Slough and Milton Keynes battled out a scoreless opening period but 3.28 into the second period Leigh Jamieson opened the scoring with the visitor’s first goal. Ross Bowers doubled their lead at 25.59 and at 28.31 Tom Carlon made it 0-3. Janne Jokila scored the fourth at 38.56 to put the visitors in the driving seat by the second interval. Slough’s Dan Rose scored a highlight reel goal at 45.45 to make it 1-4 but less than a minute later the margin was restored when Jordan Cownie scored at 46.38. Bowers netted a second at 55.07 to conclude the scoring. Slough Jets concluded their regular season home action against Bracknell Bees to open up the weekend. Slough took an early lead when Slava Koulikov fired the home team ahead after just 51 seconds but Scott Spearing equalised at 3.26. Bracknell converted their first powerplay thanks to Rob Lamey netting at 8.38 but the opening frame ended level when Frankie Bakrlik beat Tom Annetts at 17.22. Penalties were the main point of the second period but the three goals were all scored even handed as Bracknell forged a lead. Matt Foord netted at 23.46 and Lukas Smital made it 1-4 at 28.44 before Man of the match Pavel Gomeniuk pulled Slough back into contention blasting a blue line shot in at 36.11. Bracknell added to their lead when Ollie Bronniman scored on the buzzer, the goal adjudged to have been completed ahead of the buzzer at 39.59. The visitor’s man of the match scored their sixth at 41.04 and Masa scored their seventh at the other end of the period at 55.46 to complete the scoring an earn the visitors their first win against Slough this season. Slough Jets started a home and away weekend with the Guildford Flames on home ice with the season series tied at 2-2. It took just 2.50 for Slough to open the scoring when Doug Sheppard converted a Kohut penalty into a powerplay goal and 19 seconds later Dan Davies scored at even strength to make it 2-0. Joe Greener completed a fantastic solo shorthanded goal at 13.44, prompting the visitors to take their time-out and the 3-0 scoreline remained through to the first period break. Guildford enjoyed a successful second period with Greg Chambers scoring their first at 27.36 and prompting the home team to use their time-out. Soon after the resumption Matt Towe had made it 3-2 with his 28.08 goal but despite the comeback the home team held their lead and of the 41 shots in total I the period just the two goals were scored. The third period didn’t disappoint in delivering the anticipated excitement and 8.46 into the period the home team broke through with their 4th goal when Sheppard netted his second. Guildford enjoyed a shot advantage through the period and with 1.23 left to play Mark Lee left the visitors net. After a couple of chances were nullified Sheppard fed Joe Greener who fed Aaron Connolly for an empty net goal with just 5 seconds remaining on the clock. Slough Jets returned to home ice to start the weekend and welcomed the Guildford Flames to the Hangar. The home team had a dream start when Adam Calder netted just 19 seconds into the game and continued to get shots in on their opponent’s net before they settled however David Longstaff equalised at 12.21 and the period ended tied. Slough got another early go-ahead goal at the start of the second period when Joe Greener netted at 20.57. Soon after Slough had the game’s first powerplay opportunity but the visitors killed the penalty well. Matt Towe levelled the game at 27.57 but Longstaff scored his second with 2.30 left in the middle period to edge the visitors ahead. Slough again started the third period well with Darius Pliskauskas scored just 122 seconds after the re-start and the home team peppered Guildford’s netminder with some fantastic scoring chances. Longstaff completed his hat-trick at 55.47 and Smital made it 3-5 at 56.46. Peter Russell called Slough’s time-out with a minute left in regulation time and 16 seconds later Ryan Watt pulled a goal back with a 6 on 5 goal. Gregg Rockman went back on for the face-off but left soon after and then Jez Lundin secured the game with an empty net goal at 59.51. 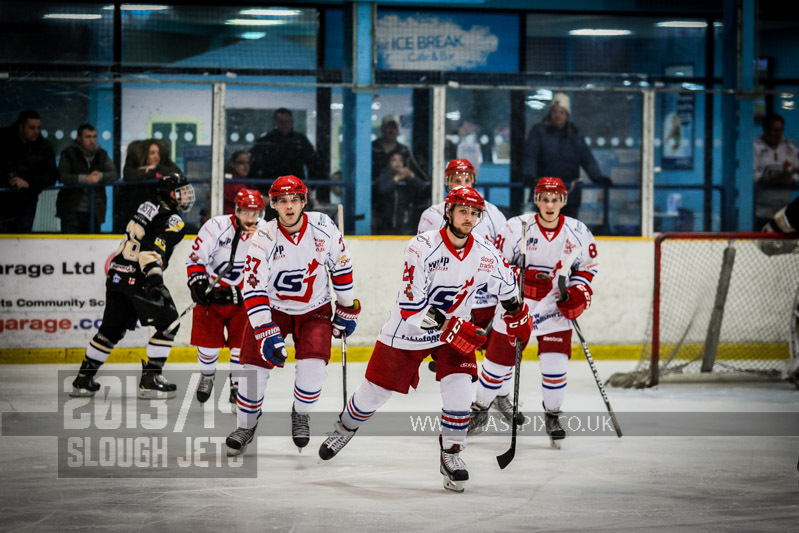 Slough Jets lined up for midweek action once again for the second leg of the Premier Cup semi-final against Guildford Flames with the visitors starting with a two goal aggregate lead. After a real end to end and open start to the game Guildford conceded two powerplays in the opening period but killed both off. With 3.00 remaining Peter Poljacek put Slough ahead on the night and only one behind on aggregate. 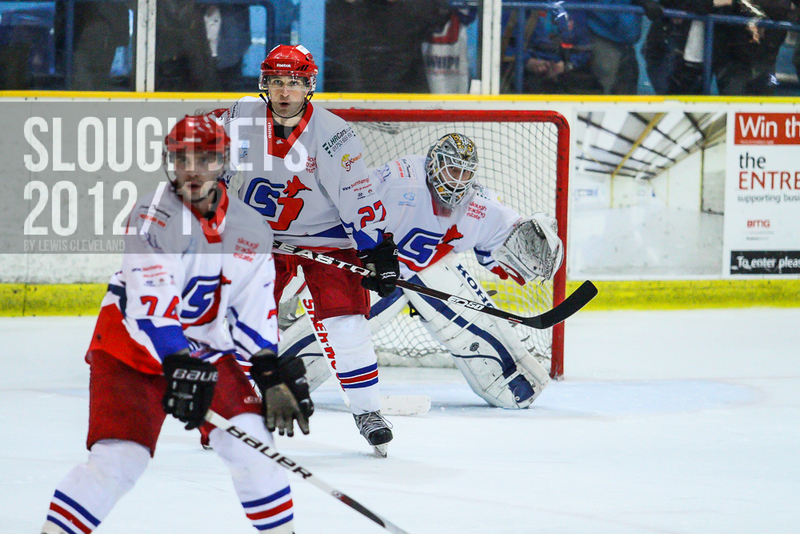 Guildford levelled up on the powerplay at 25.35 through Paul Dixon but Slough kept pressuring their opponents. The period featured some classic end to end play and both netminders were on good form but at 38.08 Ciaran Long put Slough back ahead on the evening and once again narrowed the aggregate gap to a single goal. Slough tired going into the third period but determination kept them going. 2.41 into the period Dan Davies opened a two goal margin which levelled the aggregate score but at 43.08 Rick Plant pulled back a goal. After taking a nasty knock in the second period ref Dave Cloutman left the game injured and the two linesmen combined for a two man system. As time ticked away Slough’s Ryan Watt re-levelled the aggregate score at 54.31 but Plant scored again for Guildford at 57.21. Long netted his second at 57.52 and with the aggregate score tied the game went to overtime. 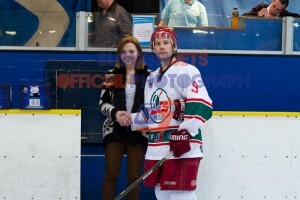 Overtime couldn’t separate the teams despite Slough enjoying a two minute powerplay advantage so it went to penalties. A combination of scoring and missing brought it down to the last penalty shot of the three and Lucas Smital’s goal wrapped up the aggregate score for the visitors who lost 5-4 but won their place in the final. Slough Jets made their final journey to Planet Ice Basingstoke for the season to face the Bison. Basingstoke scored an early goal to take the lead at 2.13 when Tom Long netted but then picked up two quick penalties giving Slough a 5 on 3 opportunity. 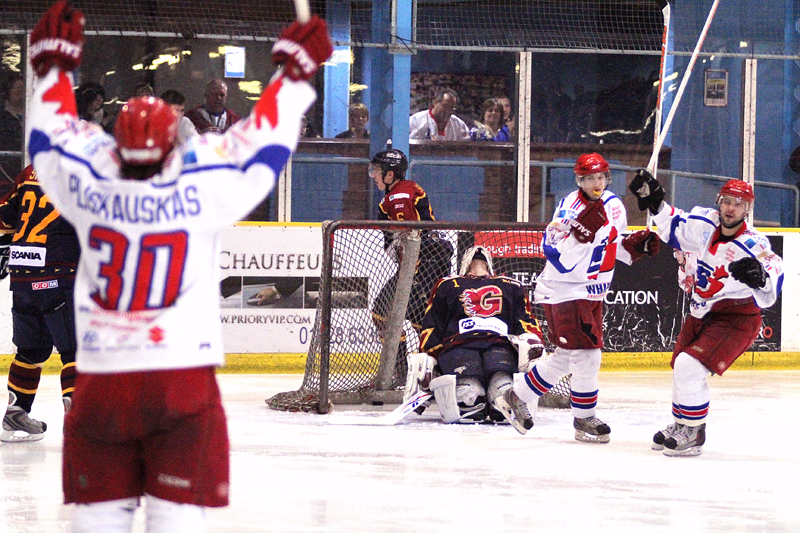 Slava Koulikov scored at 5.25 on the two man advantage and Peter Poljacek converted the remaining 1 man powerplay to put Slough into the lead. The visitors extended their lead early on in the second period when Joe Greener netted at 22.04 and proceeded to kill off two penalties to retain their lead going into the final period. Basingstoke dominated the final period shots on goal outshooting their visitors by 24-8 however Ondrej Lauko’s powerplay goal at 49.17 was quickly cancelled by Adam Greener scoring at 51.06 to restore the margin. Basingstoke called a time-out with 1.12 remaining and opted for the empty net for the remainder of the game but Slough held their lead and took the points.